Waldorf, the highly respected German synth maker, has announced Kyra, the world’s first fully FPGA (Field-Programmable Gate Array) powered synthesizer. The synth, due to debut at NAMM 2019, will be the result of a collaboration between Waldorf and independent UK developer Manuel Caballero of Exodus Digital, after the German giant's CEO heard Caballero's Valkyrie unit on the show floor at this year's Musikmesse. I was immediately aware of the fact that this was probably one of the most exciting synthesizers of recent years. "I was immediately aware of the fact that this was probably one of the most exciting synthesizers of recent years,” said Joachim Flor. “I got into conversation with Manuel Caballero and I’m now looking forward to working with this talented, innovative individual, who is also a great guy! Caballero himself said, “There's little doubt that Valkyrie's reveal at Musikmesse caused quite a stir in the synthesizer world and I had set the bar high for potential partners. Kyra's major features will be derived from the Valkyrie chassis, most notably replacing the DSP technology branded 'obsolete' by Caballero with that super-powerful home-brewed FPGA engine. Like Valkyrie, Kyra will also be 8-part multitimbral and offers two groups of 32x oversampled oscillators per voice (the total number of oscillators is 1280) with hard sync, ring mod and FM. Dual PCM wavetables provide you with 4,096 waves, while the dual analogue ladder modelling filters come in 12 and 24bB flavours. Other features include a modulation matrix, a stereo hypersaw, an arpeggiator, three EGs and three stereo LFOs with 64 shapes and MIDI sync. There’s a nine-module FX unit and Valkyrie offers 128 notes of polyphony. 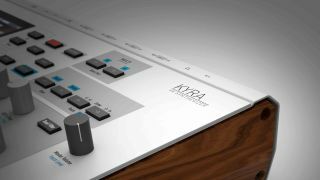 Kyra is initially scheduled for a full production launch at The 2019 NAMM Show, January 24-27, in Anaheim, California, priced at €1,899.00 EUR as a desktop/rackmount model, with a keyboard version to follow later in 2019.